Israel halted the fighting in Gaza for three hours Saturday afternoon to allow residents to get much needed humnitarian supplies, an Israeli spokesman said. The UN said the three hour lull starting at 1 PM was not enough to fully aid the beseiged Palestinians. The United Nations is drawing up a plan to reinstate the Palestinian Authority is Gaza and to provide an international peace monitoring force between Hamas and Israel, the Times newspaper of Britain is reporting. 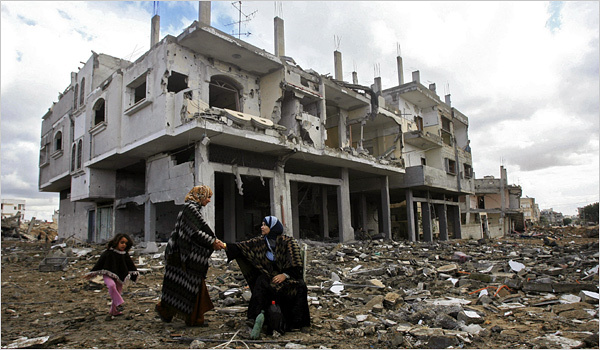 The news comes after both Hamas and Israel rejected a cease fire resolution Friday. Meanwhile, Friday night and into Saturday, Israel continued the fighting with more than 50 airstrikes into Gaza and Hamas remained active in attacking Israeli forces. Sources say Israel is now on the verge of an all-out assault upon Gaza City. Israel has issued a threat to launch a “new phase” in its two-week-old offensive that has already killed more than 800 Palestinians. It came in defiance of international calls for a cease-fire. 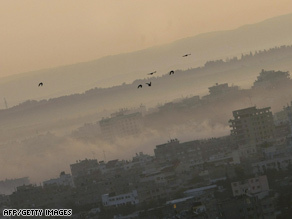 Above: Smoke rises Saturday over Gaza City from artillery strikes. This is day 15 of the fighting. The U.N. plan, the Times says, would allow a return of the Palestinian Authority, led by the secular Fatah faction, to the territory 18 months after it was expelled by the Islamist Hamas. Diplomats are considering taking a triangle at the southern end of Gaza, including the Rafah crossing to Egypt and the Kerem Shalom crossing to Israel, to be policed by Turkish and French military monitors to stop arms smuggling into Gaza. Israel rejected the first UN cease fire effort because it was not satisified with the anti-smuggling provisions. The Israeli Air Force has bombed more than 70 smuggling tunnels along the border, nicknamed the Philadelphi corridor, since the operation began. Israel launched the offensive on Dec. 27 to halt years of Palestinian rocket attacks on southern Israel. A week later, ground troops moved in, with artillery and tank fire that has contributed to a surge in civilian casualties. Palestinian medical officials say more than 800 Palestinians have been killed, roughly half of them civilians. Thirteen Israelis have been killed — four of them by militant rockets, the rest in battle in Gaza. In a possible sign of progress for the military, no rockets were fired into Israel overnight, a sharp drop from the dozens of projectiles that were launched in the early days of the offensive. You are currently browsing the archives for the Fatah category.